Smart Thermostats are a new thermostat device that connects to your internet, to allow you to control your heating and hot water through a mobile device or tablet. You simply pay to install a small device in your home and then add an app to your mobile or tablet. This will then enable you to take control of your heating and hot water remotely. How much money could I save with a smart thermostat control? It is estimated that a Smart heating product could save you around 20%, which would be around £250 on a typical heating bill per year. This shows that by investing in a product, you could get your money back in just over a year. Several of the energy suppliers provide smart heating controls, or you can indeed buy other systems off the shelf. Nest– Click here for an overview. At Carshalton Boilers, we recommend The Nest Thermostat. Since 2011 Nest claims to have saved over 8 billion kWh of energy in millions of homes worldwide. 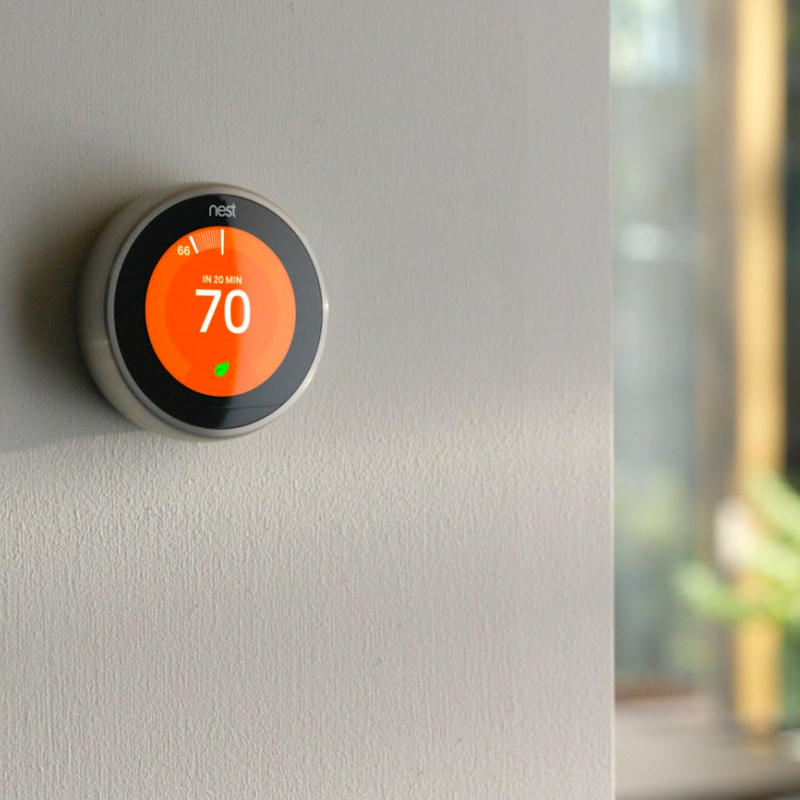 The Nest thermostat uses sensors and your phones location to check if you have left your home and therefore turns your heating down, to save energy. Over time the Nest system learns your habits and adapts the temperature of your house at times when it knows you are in. You can control the device from an App on your phone or tablet. The app also provides you with an energy history showing much energy you use every day and every month. The Hive – Click here for an overview. Hive Active Heating also allows you to control your heating from your smartphone. The Hive thermostats also work with Amazon Alexa. Hive has a number of useful features, including a geolocation tool which lets you know if you’ve left the heating on when you’re not home. Honeywell and Evohome – Click here for an overview. This smart thermostat can also be used via an app or be connected to Amazon Alexa for voice control. You can set up different schedules for each day of the week and once programmed, the thermostat does not require further scheduling. Netamo – Click here for an overview. This Smart heating device allows you to control temperature remotely and monitor energy usage via an App. Again you can also use Netatmo with Amazon Alexa. How do I get My Smart Thermostat installed? At Carshalton Boilers we are an approved supplier and installer of the Nest product. Our experienced engineers can be booked to come out to install your Nest product, we would ask you to allow 1.5 hours for the appointment during which time you will be shown how to download the App and use the device. We need to understand if you have an existing wired thermostat, in which case the Nest can be installed in the same place, if you do not have a hard wired thermostat then the Nest can be installed on a stand, in a place of your choosing and would need to be plugged into the mains. At Carshalton Boilers, we specialise in all your heating needs. We are a friendly, family run business, covering South London, Surrey and surrounding areas.